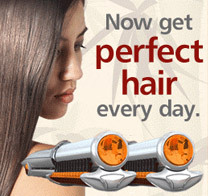 Summary: Get perfect hair that looks like it came straight from the salon! When you run the InStyler through your hair, the first set of bristles gently sort and separate your hair strands. Then, the rotating heated polishing cylinder gently glides over your hair, smoothly polishing, straightening, and styling each strand. Finally, the second set of bristles puts the finishing touch on your hair, leaving you with shiny, silky, “In-Styled” hair! It's truly amazing! No more burnt hair! Because of InStyler's patent-pending design, your hair won't get smashed and baked by the super-intense heat of a flat iron or other “hot” tools. In fact, the InStyler uses much less heat than traditional hot tools, and delivers much better results. How? Because the InStyler's gentle heat in conjunction with the rotating motion of the polishing cylinder literally polishes your hair strands individually so it doesn't need extreme heat to get amazing results.